You may recall my previous review of a Hoka shoe, the Bondi. At the time, I really loved that shoe. After a few runs though, I realized I had gotten the wrong size, and even with an insole, it was too loose. Unfortunate, really, because the max cushioning of the Bondi was fabulous for my achy feet. The first version of the Bondi had some durability issues, so when the new version came out with a reinforced upper, I was eager to try it. Although I went down several sizes when trying the Bondi on, I just wasn’t satisfied with the fit. It was just too wide and felt sloppy on my foot. So I tried on the Conquest. The Conquest’s fit is much better for me than the Bondi. 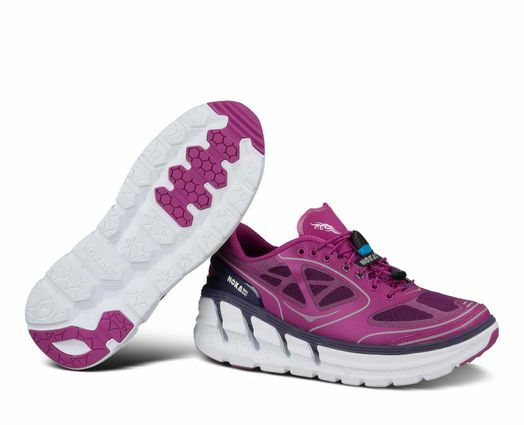 It is relatively narrow (compared to other shoes in Hoka’s line) and has a lightweight, seam-free upper. Under foot it is firmer than the Bondi, but compared to more traditional shoes, the Conquest still has an advantage. I like the quick-tie laces that come with the shoe, though some might want to cut them off to use the traditional laces for a snugger fit in the heel. The Conquest has a water-drainage system. That, combined with the high stack-height of the mid-sole, means running through puddles is no problem. I love the rocker bottom on the Conquest, just like I liked it on the Bondi. It helps me to mid-foot strike and therefore increase my turn-over, which is important right now as I’m working on increasing my speed. The rocker bottom and the max-cushioning also feels great — it protects my toes from bending too much, which means less pain from my bunion and pinched nerve in my second toe (Old Lady alert!). In the looks department, I think it leaves something to be desired, as do most Hoka’s, but that’s the sacrifice you make for a shoe that feels this good. Every run I’ve gone on since I’ve gotten the Conquest has been in this shoe, with the exception of one run — it was short and I thought I’d wear another pair that I hadn’t worn in a while. About a quarter mile down the road I was regretting my decision. You just can’t get the same feeling from a traditional shoe. My husband and I signed up for the Healthy Human Race Half Marathon Relay at the end of August, so I’ll be training for a faster 10K time between now and then. The Conquest will definitely be my go-to shoe for the summer training season.